Looks like Spokesmodel Marten has struck again…this time at the expense of every aspiring, college hopeful, senior student from the Class of 2014 who wanted to become a teacher and return to teach in the San Diego Unified School District. 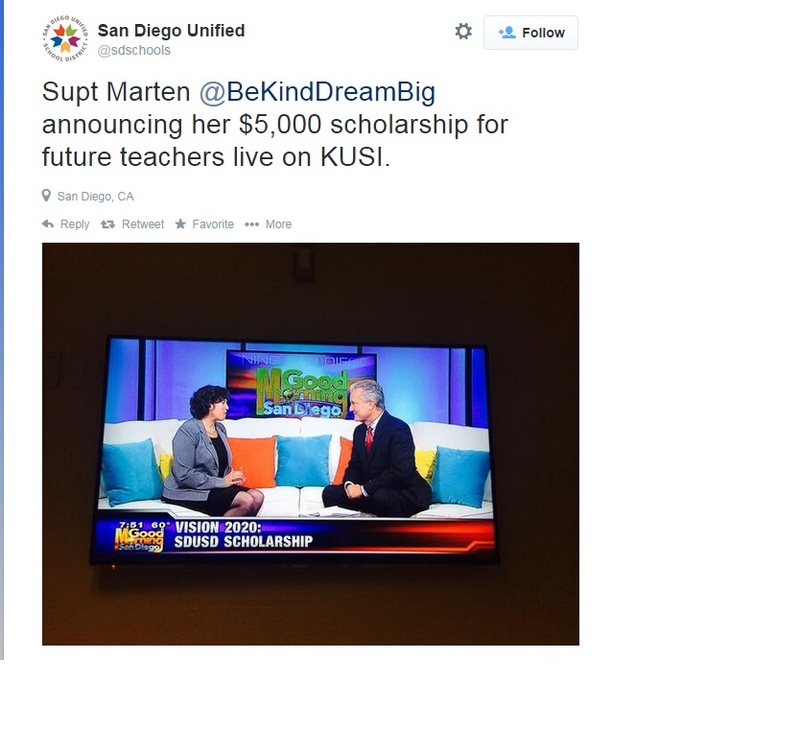 And the SDUSD Public Relations Propaganda Department put it on the District website, claimed “Marten has provided personal funding” and named it the “Teach San Diego: Superintendent’s Scholarship”. Superintendent Cindy Marten and the San Diego Education Fund are pleased to announce the creation of Teach San Diego: Superintendent’s Scholarship. Superintendent Cindy Marten has provided personal funding to launch this special college scholarship for San Diego Unified students who want to become teachers. These student scholars will give back to their community by committing to teach in the San Diego Unified School District after they receive their teaching credential from a local college or university. The application for the scholarship will be available soon. Evidence of a passion for serving youth in the community, particularly by becoming a credentialed teacher, as well as a personal letter to Superintendent Marten describing your desire to teach and a teacher who inspired you will be part of the application submission. As a teacher herself Superintendent Marten understands the value committed, caring teachers bring to ensuring a quality school in every neighborhood. In support of Vision 20/20, and as a demonstration of her strong personal convictions, Superintendent Marten is establishing this scholarship to identify and support district students who want to become teachers. We look forward to receiving applications in the coming weeks. The “Promise” was even in the “Poway Patch”! From Marten’s perspective, it may have been ANOTHER broken promise/half truth, but it wasn’t ALL bad…nobody called her on it. And Marten got AT LEAST $5,000 of FREE PUBLICITY for her stunt. Where IS all the local “investigative journalists” now that were so happy to cover her “Scholarship Publicity Stunt”? Remember…Marten is the person that had her 1.2 billion “Students First” spending plan unanimously approved the San Diego Unified Board of Trustees…but if we can’t trust her for $5,000, how can we trust her with 1.2 billion? And somewhere in San Diego there is a highly motivated former SDUSD student NOT attending college because of it..
On second though….from Marten’s perspective…it REALLY wasn’t bad at all in the end…great personal services from a motivated 18 year old with the $5,000 still in her own pocket to boot…for tips! And how ironic…Marten found it in the SDUSD budget to pay $5,000 for the shipping of the infamous MRAP acquisition AND $5,000 to return it but it was just not possible to keep her own promise to 2014 SDUSD Graduates for THEIR $5,000 Scholarship to become a Teacher. So much for your “strong personal convictions”. Thank you for this information. My husband and I have both been wondering who received the 5000 dollar scholarship. Should have known. At the last board meeting, I was listening for the name of the new SDSCPA’s principal. Several new principals were named. I think the problem with finding a replacement at SCPA is the previous principal is irreplaceable.